What is the Back Fill Process of Constructing a Home Foundation? The next step for the foundation, and building site as a whole is the back-fill process. Additional grading takes place at this point, as the foundation is filled with packed soil and the edged of the house are built up to allow even better water drainage from the foundation area. This process took only a few hours and the results are quite apparent, as the entire site looks larger and more level. 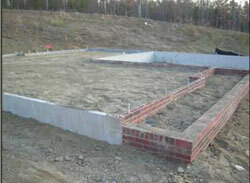 The back fill process is very important in constructing a home foundation. Having a robust and sturdy foundation is ideal for every building. This is the ultimate reason why it is imperative to have proper planning when backfilling your foundation. Repairs on your foundation can be very costly and there are even times when the damage cannot be easily repaired. Foundation failures can be avoided provided you apply the necessary back fill processes. 1. Before you begin the back fill process, you have to be sure that the foundation cures for at least five to seven days. Concrete materials tend to shift and move when you do the process haphazardly so it is only right to wait for the curing period. There are even instances when cracks may occur when you back fill too soon. 2. Determine the types of material you will use for foundation back fill. A mixture of various materials such as rocks, soil and stone are commonly used. Some soil can retain too much moisture that is not good for your foundation. In addition to this, you should also consider the lateral load which can put too much pressure on the walls of your building. 3. The best thing to do is to back fill the entire section surrounding the foundation of your home. Use a backhoe to dig and compress the earth and stone in order to clear the area for building a structure. The back fill actually protects the foundation of your home from rapid deterioration. Underground water tends to move away from your home groundwork and get diverted into another path. 4. Start the back fill immediately after the installation of the building utilities including the drainage system, insulation and waterproof structures. It would be best to use rough and abrasive type of soil for your back fill because these materials drain better than others do. Begin backfilling at the corners and be sure that the distribution of the soil is even so as to provide ample lateral support for the walls of your home. 5. Use an excavator to fill in twelve inches of mixed materials on the sides of the area. After which, compress the soil and stone using the rolling compactor. You must repeat the same back fill procedure until the entire area is completely filled. It is important to add back fill to the outer surface, which surrounds the walls of your foundation, and you can do this process by foot increments. The idea is to even the pressure which is placed on all corners and walls of your home. The back fill should be slightly higher than the level of the ground to have proper drainage. However, if you are going to use additional soil for your landscape, it would be best make a slope for your drainage system. Do not apply back fill, which contain big rocks because it will only cause damage to the base structure. Most homeowners provide external insulation for their building and this will be affected when you drop the back fill into the holes. It is always best to complete the entire back fill process before you install the sill plate, joist and sub-flooring of your home. Building a strong foundation for your home will assure you that the house can last for a longer period and that further underground repairs will not be necessary. Constructing a home is always a challenge, but if you stick with the plan you will be able to build a perfect place for you and your family.